Stampington Wants Your Aprons... - Bari J.
OK. I admit it. The above headline was just my excuse to sing, (imagine a vocal warm-up) "me-me-me-me-me-me-me-me!". 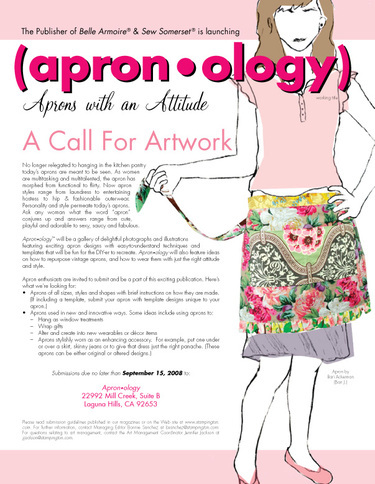 Here's my neat-o' news... Stampington is recruiting artwork for their new publication, ("Apron*ology")... the working title which I have to say I like very much. They gave this flyer/poster out at CHA with my apron on it! And they credited me too, which is a total bonus. I've been featured in this and that over the years, but for whatever reason, this just really tickles me.